When I started scuba diving at the mere age of nine I loved it. The feeling of being underwater exploring, breathing, and floating was overwhelming. When I experienced my first shipwreck and coral reef, I was hooked! I always felt limited with my dives with a bottom time of 20 to 45 minutes. When I had to return to the surface because I was low on air, I was frustrated! As regulators improved the efficiency of a scuba dive increased by approximately 15 additional minutes on the dive. Now that I am getting older, I’m back to the 20 to 45 minute dives. My need to explore the underwater world and the ocean is just as strong as it was when I was first certified at the age of 9! Now we finally have equipment that allows us up for four (4) hours on a single dive and still allows me to dive within the limits of the dive tables. I no longer feel the frustration of ending a dive simply because I am low on air. 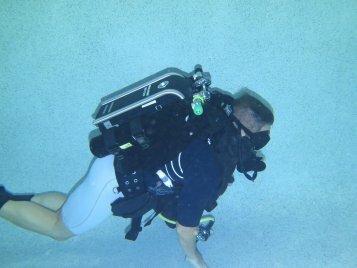 The Poseidon se7en rebreather is the only piece of equipment designed to take care of the dive planning and adjusting to my needs while diving automatically! July 8th, my buddy, Brian and I spent almost 3 hours underwater without surfacing for an airfill or taking a break! We stayed around 33 feet and were able to enjoy the dive FAR beyond my expectations. Learning new things and increasing your knowledge is undoubtedly one of the most incredible things a human being can do. Most people are understandably concerned about safety and some even decide to not get certified. What they don’t understand is diving is a relatively safe sport! With proper knowledge, training, equipment, and experience there are no limits to what we can learn and explore. With the Rebreather technology of today diving has never been safer! Provide your Rebreather with the proper diving gases and go exploring! It does most of the hard work for you – except carrying the equipment! Which, by the way is much lighter than standard scuba equipment! Don’t limit yourself with time and limited gas to dive with. Get Rebreather certified and become the freest, most comfortable breathing animal ever found on the planet. You could be an Aqua Man (Woman) too! Read more about it here!